NEW DELHI (IDN) - In the wake of the Indo-U.S. nuclear deal of 2008 allowing India to engage in civilian nuclear trade, protest movements have emerged in several sites chosen for the construction of new nuclear power plants. India is aiming to establish at least thirty nuclear reactors and derive a quarter of its electricity needs from nuclear energy by 2050. With the establishment of the Atomic Energy Research Committee in 1946 and adoption of the Atomic Energy Act in 1948, India had proceeded rather early on the path of atomic energy. Yet, two aspects related to the atomic energy programme are striking – first, the Atomic Energy Commission (AEC) and subsequently the Department of Atomic Energy (DAE) have failed to match their own estimates of electricity production; and second, there has been little public debate on these failures. Public awareness of even the nuclear tests of May 1998 and the "peaceful nuclear explosion" of May 1974 is strikingly low. According to a poll conducted in 1999 in 108 parliamentary constituencies by the Delhi-based Centre for the Study of Developing Societies (CSDS), 65 per cent of the population surveyed had heard of the Kargil conflict between India and Pakistan and yet 54 per cent of the same population had not heard of the nuclear tests that preceded it. The threat of nuclear weapons do not really cast a shadow on the psyche of the Indian masses and debates on a nuclear deterrent against Pakistan or India's relation with the non-proliferation regime remain restricted largely to the urban elites. The only atomic contact that could have touched the lives of people throughout the country is electricity-generation through nuclear plants – a task which the AEC/DAE has famously failed to perform. With the beginning of "nuclear renaissance", the masses are increasingly coming in contact with the nuclear establishment in the form of nuclear power plants. Protests are emerging at sites like Jaitapur in Maharashtra where six nuclear reactors are scheduled to be built. Similarly, in Gorakhpur, Fatehabad, one can see a certain "nuclear awareness" on the part of the protesters. Yet, it must also be admitted that these protests are case-specific with land acquisition by the government as the people’s main source of anguish. While the nuclear disaster in Fukushima has put more wind in the sails of groups like the Konkan Bachao Samiti (KBS) in Jaitapur and the Gandhian National Alliance of People's Movement (NAPM), there is yet to emerge a comprehensive anti-nuclear or peace movement in India as was seen in Europe in the 1980s with groups like the UK-based Campaign for Nuclear Disarmament (CND) and the European Nuclear Disarmament (END). It is, however, true that a nuclear threat does not configure as strongly for the Indian public as it was for a Europe threatened by superpower missile-deployment at the height of the New Cold War. In India, the protests against nuclear power plants, which are essentially protests against land acquisition, are often politicised by the involvement of groups like the Shiv Sena and the Left parties as in the case of the Jaitapur Nuclear Power Project (JNPP). It is alleged that the Shiv Sena is struggling to win back its support base in the Konkan region and is therefore encouraging the protests. Thus, it is difficult to classify these protests as a 'peace movement' or even as a nuclear abolitionist call. It is surprising that despite the long and twisted nuclear history of India, there is till date only one dedicated anti-nuclear journal in the country, namely Anumukti, which has been in publication for the last two decades. Yet, there are actors calling for an end to nuclear weapons in the country. These actors do not belong to grassroots organisations but are prominent citizens' groups like the Delhi-based Parmanu Bomb Virodhi Andolan (PBVA), journalist-activists like Praful Bidwai and Achin Vanaik, loosely formed groups like the Coalition for Nuclear Disarmament and Peace (CNDP) and international NGOs like Greenpeace. Greenpeace India launched its anti-nuclear campaign after the adoption of the Nuclear Liability Bill in 2010, and is calling for a phase-out of India’s nuclear programme. Besides, immediately after Pokhran II, some scientists formed the group Indian Scientists Against Nuclear Weapons (ISANW) with the goal of disseminating information related to the dangers of nuclear weapons. It would nevertheless be unrealistic to expect India to forego either nuclear weapons or nuclear energy. Both are here to stay and a nuclear rollback is unlikely despite the horrors of Fukushima and Chernobyl. It is a moot point whether there is an anti-nuclear peace movement in India or the protests against nuclear power plants are merely against land acquisition. But it is imperative that the Indian nuclear establishment and the DAE ensure transparency and demonstrate responsibility towards the wider public. The DAE has always shrouded itself in secrecy, protected by the Atomic Energy Acts of 1948 and 1963 and the Official Secrets Act of 1923. 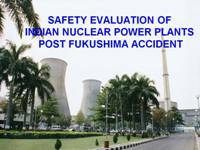 However, as nuclear energy is set to touch upon more and more lives in the country whether in the form of electricity or in the form of loss of land for atomic power projects, the department has to bring about greater clarity and transparency in its operations, especially on issues concerning nuclear safety, disaster management, environmental issues, estimated building and running costs of the nuclear plants and other relevant information. The department's annual report is difficult to decipher for non-specialists. If information is made available, it should also be made intelligible to the people. It is to be noted that even the elites opine that information available on nuclear matters is insufficient. According to a poll conducted in 1996, only 13 per cent of the elites polled believed that they had enough information on nuclear matters. Science and scientists generally possess a high degree of respectability in India. While corruption touches upon almost every aspect of public life, it is believed that the scientific establishment does not experience much corruption or if it does at all it is fairly low. In a country, therefore, where the atomic enclave is led by nuclear scientists directly under the control of the Prime Minister and where the society is in awe of the miracles science can deliver, a comprehensive anti-nuclear movement runs the risk of being construed as anti-science. Being anti-science is synonymous to being irrational and anti-modern – the epithets of backwardness that the colonial power had used against the natives and as a result the adjectives that post-colonial India was in a rush to give up as it proceeded on its path to development through scientific progress and self-reliance. This is the dilemma that affects above all the “rational and individualistic” middle classes – the missing component in India's anti-nuclear movement. Thus, as plans are sanctioned for the construction of nuclear power plants and as farmers rush to save their lands from state acquisition, an anti-nuclear movement would be far from a take off. It would remain largely a marginal movement with some sporadic spurts depending on the issue at hand, the site in question and the political parties involved.